Republican Larry Haskell celebrates being elected Spokane County Prosecutor, beating civil rights attorney Breean Beggs, an architect of Smart Justice reforms. On the campaign trail for the Spokane County Commission, Mary Lou Johnson spent most of her time talking about the various strengths and shortcomings of the local criminal justice system. As an attorney and leading advocate with the Smart Justice movement, Johnson argues that Spokane residents recognize the need for a more nuanced, effective form of law enforcement. "People get it. People totally get it," she says. "People understand that we can't keep doing what we're doing." Smart Justice Spokane, which champions rehabilitation and treatment efforts over mass incarceration, launched in 2012 and has grown into an influential community catalyst for reforming the entire Spokane justice infrastructure. City and county officials have embraced many of the group's recommendations. While Johnson and civil rights attorney Breean Beggs, another Smart Justice-backed candidate for prosecuting attorney, both lost to Republican opponents, Smart Justice advocates take pride in redefining the conversation to come. A recently re-established county Law and Justice Council has formed around implementing many new reforms, and advocates see the chance to make Spokane a leader in criminal justice best practices. Spokane County Commissioner Al French fought off a challenge from Mary Lou Johnson, who ran on a Smart Justice platform. Liz Moore, a leader in the Smart Justice effort and director of the Peace and Justice Action League of Spokane, says an upcoming Smart Justice Symposium on Saturday will continue to expand that mission. It's not if, but when Spokane will adopt a stronger system, she says, and while advocates once limited their aspirations for reform in 2012, they now dream bigger. "We're actually pushing for larger changes now than we thought were realistic two years ago," Moore says, adding. "Usually, it goes the other way. Your goals get more pragmatic." Assistant WSU professor Jacqueline van Wormer, who serves as a coordinator for the county Law and Justice Council, says Smart Justice-style initiatives have drawn momentum from a number of developments over the years. As prison populations have skyrocketed, communities and researchers have looked for more effective ways to rein in crime and cut recidivism. In Spokane, those efforts started with officials contracting with consultants like David Bennett to identify weaknesses in the current system as well as partnering with universities to seek out best practices. What Smart Justice has really driven, van Wormer says, is outreach and connection with the community. "There's great momentum," she says. "I hope it can be sustained." Officials reinstated the 19-member Law and Justice Council in August to serve as the primary engine of implementing reforms across the local system, based on a "Blueprint for Reform" completed early this year. Van Wormer says the council has been writing bylaws and sharing research with subcommittees assigned to specific reform areas such as data collection, facilities and risk-needs programs. "We're sort of laying the groundwork," van Wormer says. "Recommendations will start coming out of the subcommittees pretty quick." Moore says Smart Justice has a representative sitting on each subcommittee, and while it would have been helpful to have Beggs or Johnson working in an official capacity, the real work will require long-term pressure to ensure true reform. "It has been sustained community engagement that has driven that reform process," she says. "It takes a long attention span to create policy changes." 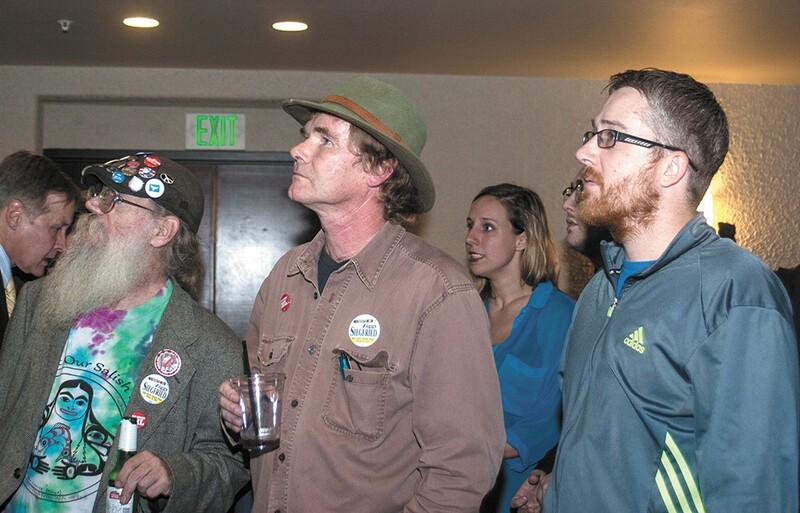 Ziggy Siegfried, a candidate for 6th District state representative, watches returns at an election party for local Democrats. When Smart Justice launched in 2012, Moore says, it hosted a symposium to help introduce professionals in the criminal justice system to a variety of evidence-based best practices in law enforcement, adjudication and corrections. Officials, police leaders, researchers and community organizers gathered to discuss what justice in Spokane could or should potentially look like. This Saturday, advocates want to engage community members who have firsthand experience with the justice system, arming residents with the knowledge to share their stories and work on various initiatives, including the "Ban the Box" campaign to remove felony checkboxes from job applications. Moore says keynote speakers will discuss innovative court models and programs taking on racial disparities in the justice system. Julian Adler, director of the Red Hook Community Justice Center in Brooklyn, will discuss community court models and Jennifer Kim, policy director for the Ella Baker Center for Human Rights in California, will discuss grassroots organization strategies. Keynote speakers, and advocates including van Wormer, will host a number of smaller group workshops on restorative justice, contacting officials, therapeutic courts and other topics. Van Wormer says she looks forward to conducting a two-way dialogue between residents and professionals working in the system. Moore and other Smart Justice supporters draw confidence from how rapidly the Spokane community has embraced the call for reform. While disappointed by the election results, they can barely believe how far the effort has come since the previous symposium in 2012. Even as Republicans celebrated their victories on Election Night, supporters of a typically liberal issue — MARIJUANA LEGALIZATION — were toasting their wins too. Voters in Oregon and Alaska approved ballot measures similar to Washington and Colorado's pot laws, with legal possession limits and a plan for regulation and taxation. Unlike Washington, both will allow small home grows. Along with plants at home, Oregon will allow adults 21 and older to have up to eight ounces of usable pot and Alaska will allow up to one ounce. In both states, the new rules won't start taking effect until next year. Across the country in Washington, D.C., a whopping 70 percent of voters said "yes" to an initiative allowing adults 21 and older to possess up to two ounces of weed and six plants (only three of which can be mature) in the District, though it did not include any regulations for how they're supposed to buy or sell that weed. Now, the D.C. Council will craft a set of regulations and hope Congress doesn't get in the way. A full veto would require action from the House, Senate and president, which may be unlikely, but lawmakers could still find ways to delay the law's implementation, as they did when voters in the District approved medical marijuana in 1998. Given the drug's federally illegal status and the switch in party power, Congress could be inclined to interfere, but they'll also be wading into an argument about whether lawmakers are quashing the voters' will. In pot advocates' lone loss last week, a medical marijuana measure in Florida won a majority of the vote (58 percent) but not the 60 percent required for constitutional amendments. Advocates there vowed to try again in a future election. Voters in the 4th District had a clear choice: They could pick MATT SHEA, the incumbent representative who has made six years of headlines with controversial statements, clashes with local Republicans and years of refusing to talk to local media outlets. 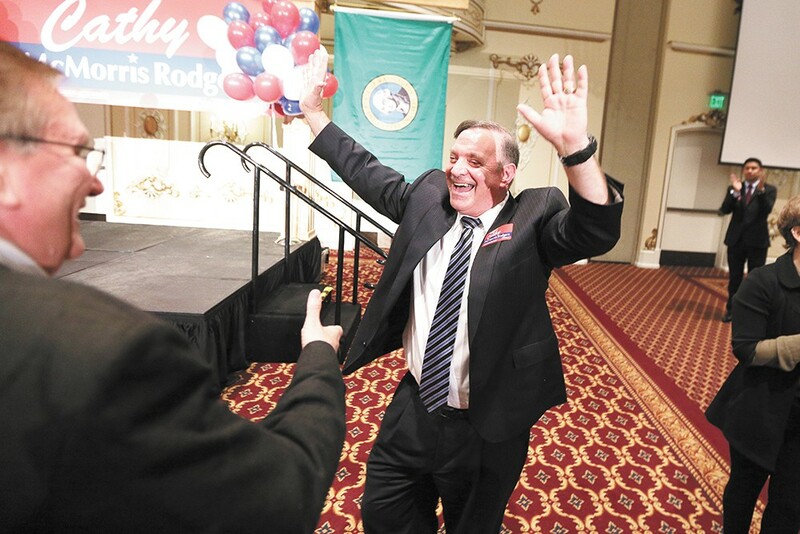 Or they could pick JOSH ARRITOLA, a Republican espousing most of the same positions as Shea, but with support from unions and a willingness to shake hands with Democrats. The Republican Party was split: Some, like former city councilwoman Nancy McLaughlin, offered resounding support for Arritola. Others, like Sen. Michael Baumgartner, stuck with Shea. Still others, like Rep. Kevin Parker, refused to get involved. It all looked like it was shaping up to be a tight race. It wasn't. Arritola lost by nearly 15 percentage points, worse than he did in the primary, and even worse than the performance of Amy Biviano, an actual Democrat, two years ago. The 4th District doesn't just want a Republican. It wants a Matt Shea Republican. Arritola says polling after the primary suggested a reason he struggled in the polls was name recognition. And despite being hammered by his opponent for being secretly liberal, he wasn't liberal enough for some voters. "The polling showed we weren't able to close the deal with Democrats," Arritola says. "There's a segment we really campaigned hard for, but [they] weren't willing to pull the trigger for a Republican." Of the fraction of people in the 4th District who actually voted, nearly 10 percent voted for neither Shea nor Arritola. A similarly large chunk of voters went for "none of the above" in the other 4th District race, where schoolteacher Bob McCaslin, Jr., wielding Shea's endorsement, beat former Spokane Valley mayor Diana Wilhite 57 to 42 percent. Given how close her race for IDAHO STATE SUPERINTENDENT OF PUBLIC INSTRUCTION turned out, Sherri Ybarra is undoubtedly glad she decided to vote this year. Throughout the campaign, the media coverage of Ybarra was devastating — detailing a string of gaffes and corrections. She didn't vote in a general election for years. Her campaign site lifted big chunks of rhetoric from her opponent's website. By contrast, nearly everything was in opponent Jana Jones' favor: Idaho's education system has produced terrible results. The previous Republican superintendent was unpopular. Jones didn't make any major mistakes. She had experience at all levels of education. She raised three times as much money. Just one problem: She's a Democrat. Idaho hates that. So the election was tight — less than 6,000 votes — but Ybarra still won. She faces the challenge of managing education in a state where teachers leave, kids don't go to college and legislators slash funding. Blame the national Republican wave, but Idaho looks redder than ever. Certainly redder than 2008, when western and North Idaho actually sent a Democrat to Congress. Despite running against damaged Gov. Butch Otter, Democratic candidate A.J. Balukoff couldn't crack 43 percent. Democrats have taken solace in two victories in Lewiston: Democratic Rep. John Rusche fended off his challenger by fewer than 50 votes, while Democratic challenger Dan Rudolph managed to squeak by with fewer than 30 (though Idaho's Republican Party is gunning for a recount). "To actually gain a legislative seat in this climate, as we did, is a respectable outcome," Idaho Democratic Party Chair Larry Kenck says in a statement. "We hold our heads high today. Our candidates hold their heads high." Election season may be over, but the real fight between Republicans and Democrats in Washington begins in January, when state lawmakers duke it out over how to create a BALANCED BUDGET for the 2015-17 biennium. The good news is, according to projections by the Office of Financial Management, Washington can expect to collect an extra $2.7 billion in the 2015-17 budget cycle. The bad news is Washington's sluggish revenue growth isn't enough to cover all of the state's competing budget pressures. To fulfill the state Supreme Court's order to fully fund basic education in the McCleary case, the legislature is required to invest significantly in K-12 education — more than $2 billion in the 2015-17 budget, according to legislative committee analysis. On top of that, Initiative 1351 to reduce class sizes is headed for a narrow victory, which the OFM estimates will cost about $2 billion over the next biennium. Meanwhile, state employees haven't seen a cost-of-living pay raise in six years; tuition at public colleges faces rising inflation; and following the state Supreme Court's decision on psychiatric "boarding" in emergency rooms, the legislature is obligated to fund additional beds for mental health patients. Ahead of the November election, Democrats like Rep. Marcus Riccelli proposed closing frivolous corporate tax loopholes to solve the state's budget woes. 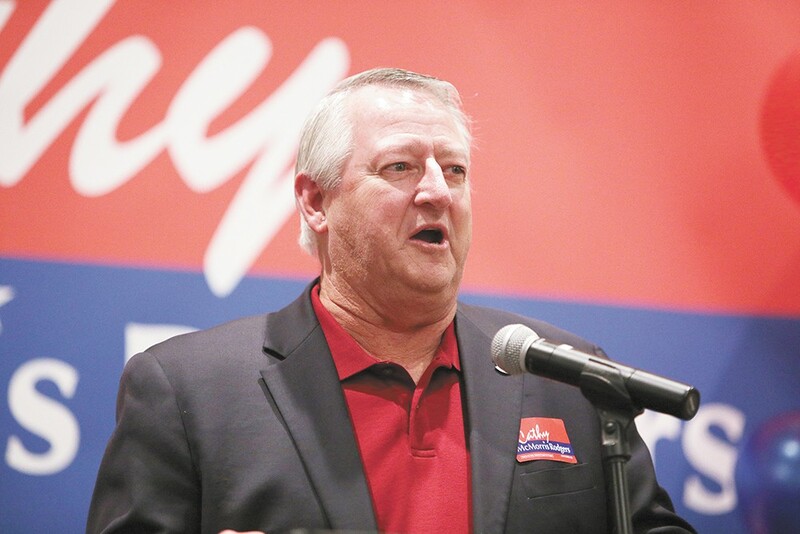 Republicans like Sen. Michael Baumgartner would rather set aside new revenue growth for education spending and find savings in the budget by consolidating and reforming state government. Both parties are skittish when it comes to talking about tax hikes, but, says Remy Trupin, executive director of the left-leaning Washington Budget & Policy Center, lawmakers will have to consider raising new revenue in order to meet the state's needs. "It is mathematically very difficult to imagine how you balance the budget and not have economically damaging cuts without raising revenue," Trupin says. "The question is, what do they put on the table?"